Shengjian mantou (Wu Chinese: ssanji mhoedhou), shengjian bao, or shengjian for short, is a type of small, pan-fried baozi (steamed buns) which is a specialty of Shanghai. It is usually filled with pork and gelatin that melts into soup/liquid when cooked. It has been one of the most common breakfast items in Shanghai since the early 1900s. As a ubiquitous breakfast item, it has a significant place in Shanghai cuisine. In Modern Chinese, a filled bun is usually called baozi or bao, while an unfilled (plain) bun is usually called a mantou. However, in the Jiangnan region where Wu Chinese is spoken, the word mantou" refers to both filled and unfilled buns, as in Middle Chinese. Hence, the shengjian mantou is called a mantou despite being a filled bun. The same is true of the xiaolong mantou, which is often called xiaolongbao in the other varieties of Chinese. Shengjian is made from semi-leavened dough, wrapped around pork and gelatin fillings. Chopped green onions and sesame are sprinkled on the buns during the cooking process. The name of the bun comes from its method of cooking. The buns are lined up in an oiled, shallow, flat pan. Typical commercial pans are more than a metre in diameter. The buns are lined up in the pan with the "knot", where the dough is folded together, facing downwards and thus in direct contact with the oiled pan and fried into a crispy bottom during the cooking process. Water is sprayed on the buns during cooking to ensure the top (which is not in contact with the pan or the oil) is properly cooked. After frying, the bottom of the bun becomes crunchy, and the gelatin melts into soup. This combination gives the shengjian its unique flavour. Because the buns are tightly lined up in the pan, they become somewhat cube-shaped after cooking. While waiting to be served, the chef may flip the buns so that the fried base faces upwards to prevent the crispy bottom from getting soggy in the process of cooling. The traditional shengjian has pork fillings. Common variations include chicken, pork mixed with prawns, and pork mixed with crab meat. Shengjian is traditionally sold in lots of four (one "tael"). It is usually eaten at breakfast, and can be accompanied by a small bowl of clear soup. The buns themselves can be dipped in Chinkiang vinegar. Because of the method of cooking, especially the relatively hard bottom, the buns are quite durable, and are therefore easily portable. They are often packed in paper bags for take-away consumption. Some shops or restaurants sell the item throughout the day as a dianxin or snack. It is rarely found as a dish in a main meal. 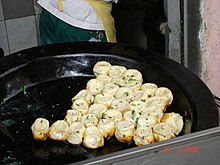 Wikimedia Commons has media related to Shengjian mantou. This page was last edited on 30 November 2018, at 23:00 (UTC).